New entity set apart from MS. Anti-Neurofascin demyelinating disease. After separation of "Neuromyelitis optica" (anti-AQP4) and "anti-MOG demyelinating disease" from MS, it seems that there is a new "type" of MS that could be set apart from the rest. It is proposed to be called something like Anti-neurofascin disease or anti-neurofascin autoantibody demyelination, and a subset of MS patients are supposed to be inside this new entity. 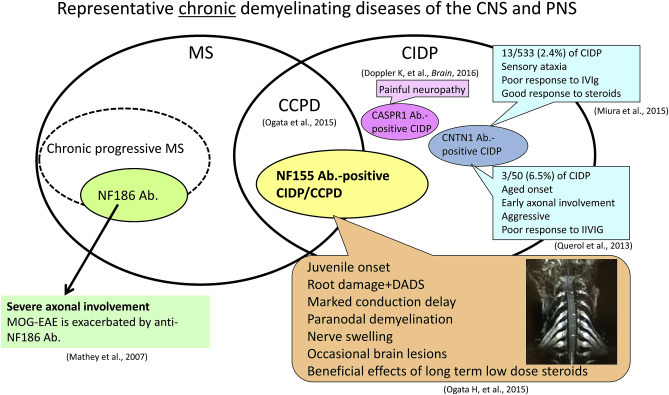 By discovery of autoantibodies against nodal and paranodal proteins in a minority of patients with MS, CCPD, and CIDP, a concept of nodopathy or paranodopathy is emerging. Although the significance of anti-NF antibodies in chronic progressive MS needs further large scale studies, IgG4 autoantibodies against paranodal proteins in CIDP are associated with unique features specific for each condition. Establishment of IgG4-related demyelinating conditions contributes to diagnosis and treatment strategy, because IgG4 autoantibody-related neurological diseases are often refractory to conventional immunotherapies, such as IVIg. The mechanism by which autoantibodies belonging to the same IgG4 subclass can cause each IgG4 antibody-specific feature remains to be elucidated. For example, extensive spinal root hypertrophy and pronounced elevation of CSF protein seen only in IgG4 anti-NF155 antibody-positive CIDP, but not other paranodopathies, such as anti-CNTN1 and anti-CASPR1 antibody-positive CIDP, suggest severe inflammation of the nerve roots (Ogata et al., 2015), which cannot be adequately explained by IgG4 antibody functions. We found increased CFS cell counts and proinflammatory cytokines in IgG4 anti-NF155 antibody-positive CIDP patients (submitted for publication); therefore, NF155-specific T cells may be involved in spinal root and CNS inflammation. As a distinct association of HLA class II alleles with anti-NF155 antibody-positive CIDP was reported in Europeans (Martinez-Marinez et al., 2017), future studies on HLA class II antigen-restricted T cells are called for to decipher the mechanism of this condition. Another important issue is the mechanism by which IgG4 antibodies to nodal and paranodal proteins emerge. IgG4 antibodies can block antibodies that alleviate allergic inflammation by interfering with the binding of allergen-specific IgE to allergens. IgG4 class switch requires help from type 2 follicular helper T cells producing IL-4, IL-10 and IL-13. Thus, environmental antigens cross-reacting with nodal and paranodal proteins may be important to study in future. First it was Neuromyelitis Optica . It was set appart from MS when anti-AQP4 antibodies were found to be specific of this kind of disease. Do *you* have bona fide MS? How can you tell? Does your MS give you the ability to claim for disease modifying therapy? Do you care? Demyelinating disorders. Cousins of MS updated. An interesting diagram speaking about Anti-MOG associated encephalomyelitis. Some MS cases could be anti-MOG in reality. Get informed. IMPORTANT: Demyelinating disorders. Cousins of MS updated. What is Typical MS vs A-typical MS? It's been an interesting six months. Finally, I have an MS diagnosis.